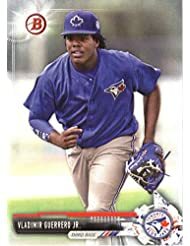 Vladimir Alvino Guerrero (born February 9, 1976 in Don Gregorio, Nizao, Dominican Republic), and known in his native Dominican Republic as Miquéas (Spanish for Micah), is a former baseball player who spent 16 seasons in Major League Baseball (MLB) as a right fielder and designated hitter. 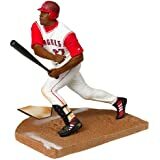 He played for the Montreal Expos (1996–2003), Los Angeles Angels of Anaheim (2004–09), Texas Rangers (2010), and Baltimore Orioles (2011). A nine-time All-Star, Guerrero was widely recognized for his impressive offensive production—regularly hitting for power and average—as well as his defensive range and strong throwing arm. In 2004, Guerrero was voted the American League (AL) Most Valuable Player (MVP). 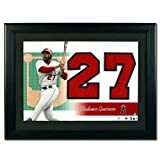 He helped lead the Angels to five AL West championships between 2004 and 2009 and was voted one of the most feared hitters in baseball in a 2008 poll of all 30 major league managers. Regarded as the game's premier "bad-ball hitter," Guerrero consistently hit balls thrown well outside the strike zone, a skill evident on August 14, 2009, when he hit a pitch after it bounced in front of home plate. With his aggressive batting style, he hit more than 30 home runs in each of 8 seasons and surpassed 100 RBI 10 times, though he had just 2 seasons with at least 65 walks. 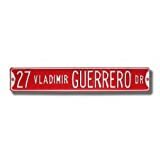 In the first pitch of the at-bat, Guerrero hit 126 home runs, believed to be the most ever, and put 1,780 balls in play. On September 26, 2011, Guerrero surpassed Julio Franco as the all-time MLB leader for hits by a Dominican player. (Adrián Beltré claimed the record from Guerrero in 2014.) Guerrero was inducted into the National Baseball Hall of Fame in 2018. Veteran pitcher Jamie Moyer described Guerrero's style: "I say this respectfully: he's a freak. He's a very good hitter without a strike zone. He can hit the ball in, hit the ball off the plate away, hit the ball up and go get the ball that's down. He covers the plate, and beyond." Below are Guerrero's 2004 MVP stats. For his career stats, click here. 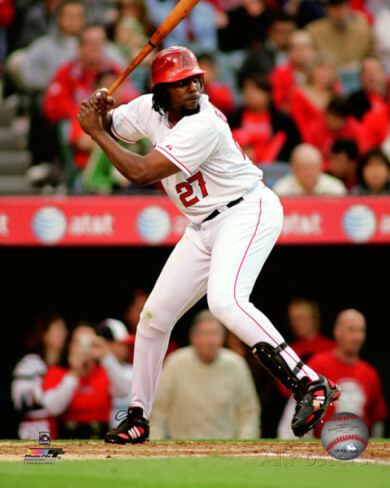 Featured here are Vladimir Guerrero posters, photos, giant collectibles and apparel.